eBay launched a “Spring Black Friday” shopping event, but of course it’s limited to its eBay Deals site, since it has no way for third-party sellers to participate outside of the eBay Deals platform. It begs the question, how many shoppers attracted to the deals site go on to shop the main eBay.com marketplace? Because there’s no doubt that products offered on eBay.com/Deals compete with the items offered by the majority of sellers on the core eBay.com site. Note that in 2 years, things could look very different when eBay manages payments. To get an idea of how that would work, look at Etsy. Once it took over the payment processing on the Etsy marketplace, the company was able to give sellers the ability to opt in to site-wide marketing promotions. 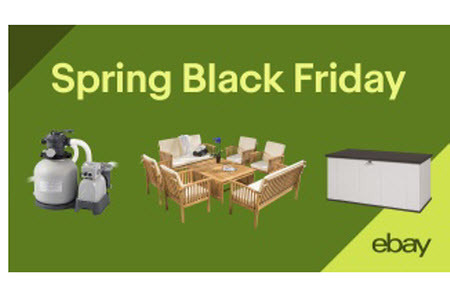 eBay celebrates home improvement season with “Spring Black Friday,” announcing weeklong discounts on hundreds of must-have home and garden items. Beginning today at 8 am PT, shoppers have access to seven fresh days of savings, including major markdowns on seasonal essentials: pool, patio, grills, outdoor and more. Everyday through April 15, eBay will reveal a new deal on eBay.com/Deals, all with free shipping. This Spring Black Friday, shoppers can shop and save on top brands, including Dyson, Sun Joe, Roomba and more. Additionally, thanks to eBay’s installation services, shoppers looking to add assembly or installation services to their purchases, can take advantage of thousands of select listings where they can bundle their purchases with pre-screened local services professionals across the U.S. at check out through partners Handy, Porch and InstallerNet. Start shopping now to find amazing spring savings at eBay.com/Deals.